In January 1917, American cinematographer Ariel Varges accompanied the British army to cover the desert war in Mesopotamia (Iraq). Advancing on both sides of the Tigris river, forcing the Ottoman army out of a number of fortified positions along the way, the British on March 11, 1917, entered Baghdad where they were greeted as liberators. Varges' film work during World War I has been described in more detail in our book American Cinematographers in the Great War. As mentioned in a previous weblog, as a result of a new resource website on the history of British newsreels we are now able to pinpoint Varges' film work with the British, starting with his coverage of the Great War at Salonika, Greece, right down to the desert war in the Middle East. Commissioned as a Captain in the British Army, Varges was in a unique position to cover the First World War with his movie camera. "With the British in Baghdad"
The newsreels shot by Varges were released by the British War Office and appeared in the Official Topical Budget series that was shown twice a week in British theaters. 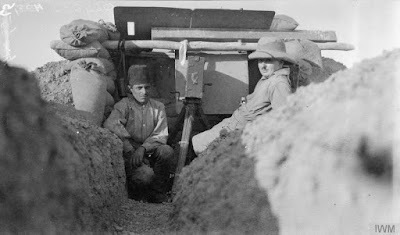 The footage was probably syndicated to other newsreels both in Europe and in the U.S.A. Based on the records available, Varges is credited as cinematographer for 13 newsreel scenes showing the desert war between the British and the Turks in 1917-1918. He was in Baghdad around the time when the city was captured and his first newsreel contribution "With the British in Baghdad" appeared in Topical Budget No. 323-2, that was released on November 3, 1917. Varges' newsreel coverage shows that he followed the military campaign quite closely. In September 1917, Varges covered the second Battle of Ramadi. 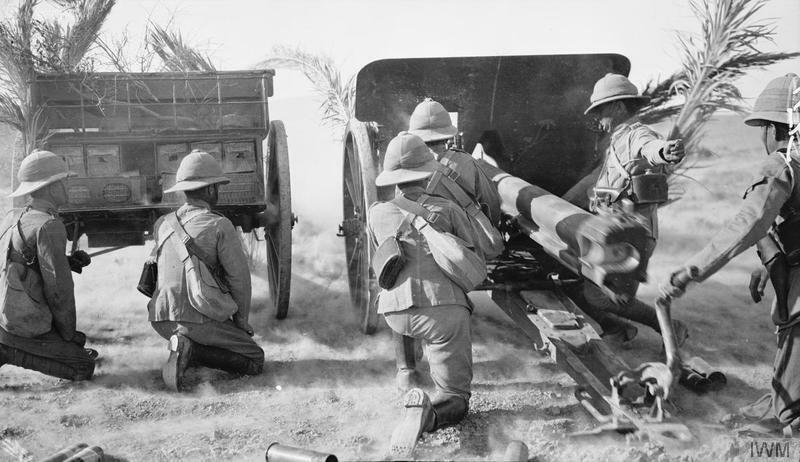 With artillery support, British forces advanced up two ridges to the south of Ramadi in the face of Turkish machine gun, rifle and artillery fire. Both were taken by the early afternoon of September 28, 1917. 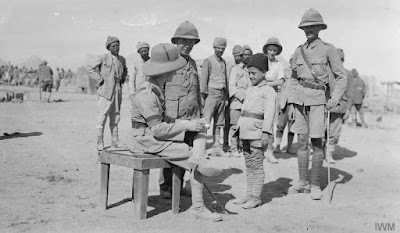 The Turkish surrender came just in time, as a powerful sandstorm began shortly afterwards which reduced visibility to a few metres. Had it struck earlier, the garrison could easily have slipped away. The British were now able to drive the Turks completely out of Mesopotamia. The capture of Ramadi also led to the local Arab tribes switching sides and supporting the British. Although a number of remarkable photographs by Varges have survived on this battle the newsreel references available do not mention any movie scenes taken by him at Ramadi. He did cover the Camel Corps during its operations in the Iraqi desert, and filmed French as well as Indian troops in action. The extant footage also has an interesting scene showing a spy who got caught by the British. Varges spent the final months of the war around Baghdad taking pictures of daily life in the city. A letter from his personal collection that was sold recently on eBay indicates that he was hospitalized in December 1918. This letter was written from the "Officers Hospital" in Baghdad. Apparently Varges became ill with fever while being evacuated from Iraq and was gravely ill for several weeks. In this letter to his mother, Varges describes how he was "shell shocked" during an attack. In March 1919, Varges returned to the United States and was discharged from the British army. He remained a globetrotting war photographer for the Hearst newsreels until shortly before his retirement around 1952. Out of 13 newsreel scenes credited to Varges on the British desert war we were able to identify 4 scenes in the film collection of the Imperial War Museum. Apart from regular newsreel footage, the Imperial War Museum has much more film shot by Varges while he accompanied the British army in Mesopotamia (Iraq). We will return to this subject in another weblog. The newsreel scenes shot by Varges on the British desert war have been uploaded on our YouTube channel. In the National Archives the authors recently found a fascinating film that was shot in 1918 by Wilbur H. Durborough for the U.S. Signal Corps, showing a staged attack on Fort Lewis in Washington. Durborough's film work during World War I has been described in more detail in our book American Cinematographers in the Great War. In 1915 he and his camera operator Ries went to Europe and filmed with the German army on the Eastern Front. Their film On the Firing Line with the Germans has been restored in 2015 by the Library of Congress, based on our film research. This previous weblog has a link to a TV show by American History TV with commentary by authors Cooper Graham and Jim Castellan on this film project. In November 1917 Durborough accepted a commission as a Lieutenant in the U.S. Signal Corps which had been assigned to cover the American intervention into the war. During his time in military service, Durborough produced a short film at Fort Lewis, Washington, to demonstrate how the troops there would defend against an attack. This clearly wasn’t a training film but intended to show the United States Army was well prepared for war. According to a contemporary report in the Seattle Star, Durborough's film was released through the Commitee on Public Information - America's wartime propaganda agency - to the state councils for defense for public exhibition. As he did in his 1915 film, Durborough followed a story line. Initially troops are seen relaxing until the alert comes via semaphore and phone, then troops are mustered and deployed, followed by escalating displays of camouflaged infantry and artillery counterattack and concluding with evacuating and treating the wounded. Durborough appears to have believed it important for war film credibility to include casualties, real or staged. His film also emphasized how soldiers felt at home in camp, with scenes showing visits by their family and loved ones. We were extremely fortunate in having found Durborough's original script "The Western Spirit" for this short film. His personal script, as well as the footage, was filed by the Signal Corps in 1936 as part of their Historical Film Series on World War I under the title Training at Camp Lewis, Washington (NARA, RG 11-H-1245). Here is a download link to the complete production file on Durborough's film. The Signal Corps documents not only have Durborough's list of titles for this film project, but also a revised list that was used for the final edit in 1918. The file shows that Durborough's input was used for almost all of his film. Contemporary press reports mention Durborough made this movie together with press photographer Edward N. Jackson who worked for the New York Daily News after World War I. But the Signal Corps film file does not credit Jackson, so it seems likely he only did still photography for this project. By using Durborough's list we could identify almost all scenes in this short film and reconstruct the original movie. We have uploaded Durborough's reconstructed film on the attack on Fort Lewis on our YouTube channel and have added contemporary World War I music to this clip. Enjoy! On August 31, 1916, American cameraman Merl LaVoy was just behind the frontlines in a hospital at Compiègne. There he filmed Nobel Prize winner Alexis Carrel, the man who invented vascular surgery and performed the first heart bypass operation as well as the first heart transplant. Together with the famous aviator Charles Lindbergh Carrel also laid the groundwork for the artificial heart. 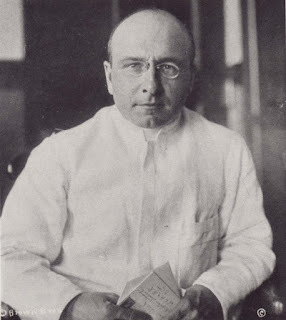 The authors recently found a letter by LaVoy in the archives of the French Academy of Medicine which sheds some new light on how he captured Carrel with his movie camera. 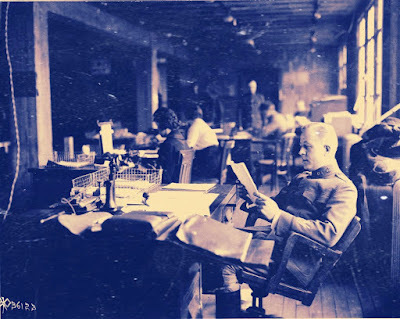 Carrel played an important part in the history of World War I. During the First World War Carrel and the English chemist Henry Dakin developed a special method of treating wounds based on chlorine which, preceding the development of antibiotics, was a major advance in the care of traumatic wounds. 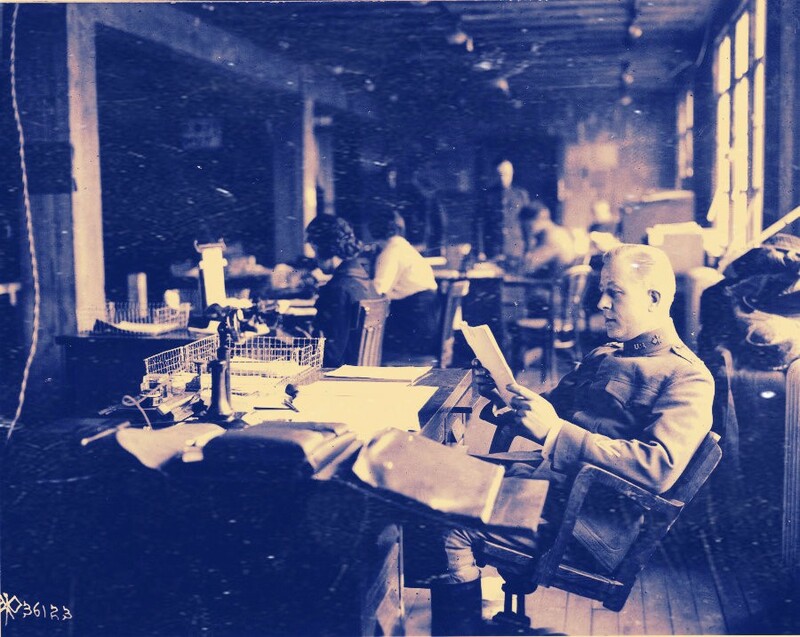 The Dakin-Carrel method was an absolute breakthrough in medical treatment during World War I. Deaths as a result of gangrene were reduced significantly as a result of this discovery. Strangely enough, when LaVoy visited Carrel in the summer of 1916 he gave him most of the credits. Although Dakin had invented the antisceptic chemical that was actually used he hardly was mentioned in LaVoy's film. The truth of the matter was: Dakin was a shy and retiring person who was reluctant to speak in public. Carrel on the other hand was quite a different man. He was a short Napoleonic figure and in his photographs looks like an arrogant prelate of medical science. As a result, it was Carrel who cashed in on most of the publicity. Headlines in the New York Times soon blazed: “Drs. Carrel and Dakin find new antiseptic. Remedy said to make infection impossible.” Certainly the technique and the solution were used all over the world and saved thousands of lives, with Carrel largely taking credit for Dakin’s discovery. After the war Carrel came home to a hero’s welcome. For this Carrel was even awarded the French Légion d'honneur. In a previous weblog we mentioned how we found footage from Merl LaVoy's first film project Heroic France (USA, 1917). Among the scenes that we found are a number of close ups showing Carrel which were taken at his hospital in Compiègne. Shortly after recording these films LaVoy corresponded with Carrel on these movie scenes. The letters show there was a considerable interest in LaVoy's film work. At the request of Carrel's colleagues he sent them duplicates of his films which were greatly appreciated. You can read and download LaVoy's and Carrel's war letters here. Courtesy: Bibliothèque de l'Académie nationale de médecine (Paris). Here is LaVoy's war film Heroic France which was posted before on our YouTube channel. The scenes showing Alexis Carrel can be watched at 3: 17 minutes. In the spring of 1915, American cameraman Albert K. Dawson followed the attack by the Austro-Hungarian army on the Eastern Front. The target was Przemyśl, a heavily fortified city that had been taken by the Russians earlier that year. Segments of Dawson's war film The Battle and Fall of Przemyśl - long considered lost - were recently found by the authors in the Austrian film archives. 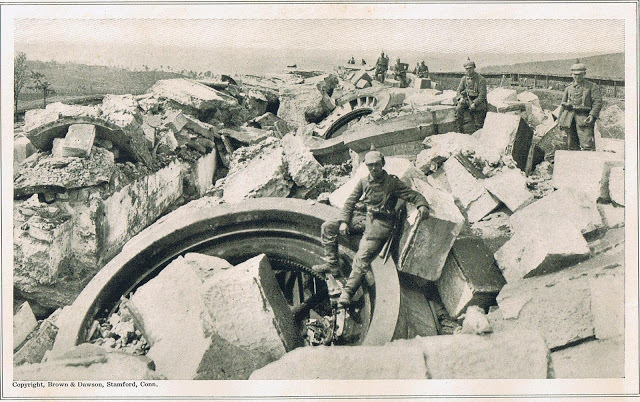 While researching our book on the American cinematographers in the Great War we came across various film fragments that were shot by Dawson during this offensive. Apart from footage at the Library of Congress the Imperial War Museum also has scenes from this film. The film in London turned out to be a copy of a movie with Hungarian intertitles. The frame enlargements that we found, as well as the lecture that was used for the exhibition of the film in the U.S.A, all pinpoint to Dawson who as a neutral American film correspondent appears to have done most of the principal cinematography for this movie. The most complete sequence comes from footage which is now at the Austrian Film Museum in Vienna. Running 14 minutes, the film starts with the Austrian artillery bombarding the forts of Przemyśl. In the next scene we see Dawson walking on the battlefield, together with an Austrian soldier. He is also seen inspecting the artillery that had been taken from the Russians. The film ends with a celebration of the capture of the city which took place on June 3, 1915. To recontruct the original look and feel of this war film from 1915 as released in the USA we translated the Hungarian intertitles into English and added contemporary Austrian military music to these film segments. For some interesting backgrond information, here is a download link to a publicity leaflet of this World War I film, which was used during an exhibition in November 1915.